The students have the opportunity to gain experience working on real projects, under the supervision of industry veterans. The companies proposing the projects gain access to talented students to develop prototypes or proofs-of-concept at no cost. The CS faculty gains access to many industry professionals each semester that effectively become part of their training ranks, also at no cost. The early connection between companies and students may help the students to find a job in the future, as well as help the companies to find good candidates. In the last semester I had the great pleasure to be the supervisor of a project entitled “Movie Quotes Search Engine”, together with my friend Oren Somekh. We were very lucky to “hire” for this project two brilliant students: Meytal Bialik and Zvi Cahana. The results of their work were very impressive, and above our expectations. 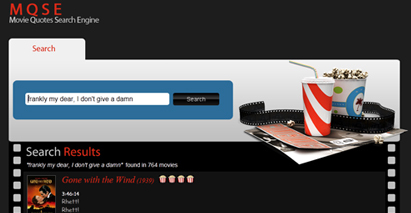 You can check the Movie Quotes Search Engine project to learn more about their work. I hope this serves as inspiration for other students looking for practical experience. It should also serve as motivation for other software companies to cooperate with the Technion in this important initiative. What do you think about that? I will be happy to have your comments below. This entry was posted in Yahoo! and tagged Yahoo!. Bookmark the permalink. Looks like a copy of subzin.com that has been around for several years. Allon, this is not a “copy” of other sites. The goal of the Industrial Projects is not to develop new and innovative products, but to allow the students to acquire practical experience. In this case, the students learned a lot about how to build a search engine, which is not trivial. But I can also say that their project is better than Subzin, both on the quality and the coverage of the search results. It also has the very cool feature of playing the movie segment related to the search result. Unfortunately we currently do not have a live demo publicly available to demonstrate that. It is not a revolutionary new idea to combine academia and industry in engineering, but it is always great to see it work. Universities are “talent-magnets”, and companies tailor university curriculum to meet their needs. As the idiom goes: One hand washes the other. How much time was spent on the project? Is it really free of cost? Shalom, Hadar, it’s indeed a very nice project. The search engine is not publicly available yet, but I will send you an email with a link to our demo server. The project was developed by two students in a single semester, from conception to delivery, in total some four months of work. It is worth mentioning that both students also worked part-time in high-tech companies. The search engine was implemented over Lucene, which is Open Source, and all the raw data with the movie subtitles is also publicly available for no cost.